Yash Raj Films mega action-adventure Thugs of Hindostan certainly has everyone on first watch with its fantasy tale set in the high seas. It boasts of a larger than life, never seen before action extravaganza and an incredible casting coup that brings together two of the biggest legends of Indian cinema, Amitabh Bachchan and Aamir Khan on screen for the first time. It also stars Katrina Kaif and Fatima Sana Shaikh in this high sea adventure! Fatima Sana Shaikh made an impressive debut in Dangal where she played a young wrestler and she really wowed audiences with her performance/ This time she plays the role of the warrior princess Zafira, a daredevil and an outstanding fighter. Her look has become quite a talking point but creating Zafira’s look proved to be a tall task for the film’s costume designers, Rushi and Manoshi. “Zafira was one of the most challenging characters for us. We found fabrics that we thought best described Zafira and then we got her to stand like a mannequin and draped and draped fabric for five to six hours,” they state. “Even with the armour, we had to keep her frame in mind and design an armor which is flattering and yet made her look very strong. 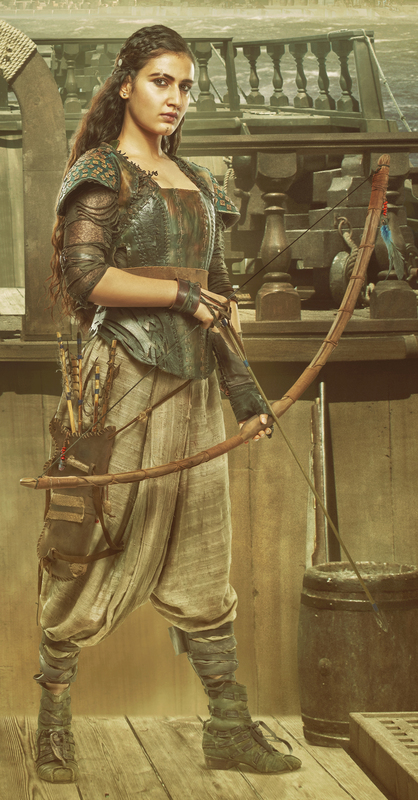 One of the very interesting things that she has as a part of her armour, which nobody else has is the archery glove. It is designed so that she can do exceptional archery,”they added. Playing Zafira required training and tons of practice in archery for Fatima. Sporting a heavy costume that includes armour and elaborate headgear added to the part’s demands. “I could have never imagined that playing Zafira’s role would be difficult because of the hair. Sitting for three hours every day in the morning before the shoot is quite a pain,” says Fatima, laughing. “Kudos to them because they imagined me so completely different,”she concludes. Yash Raj Films Thugs of Hindostanis the biggest visual spectacle hitting the big screen this Diwali. It boasts of a larger than life, never seen before action extravaganza and an incredible casting coup that brings together two of the biggest legends of Indian cinema, Amitabh Bachchan and Aamir Khan on screen for the first time. It also stars Katrina Kaif. Thugs of Hindostan has been directed by Vijay Krishna Acharya. It is set to release on November 8, in Hindi, Tamil and Telugu.